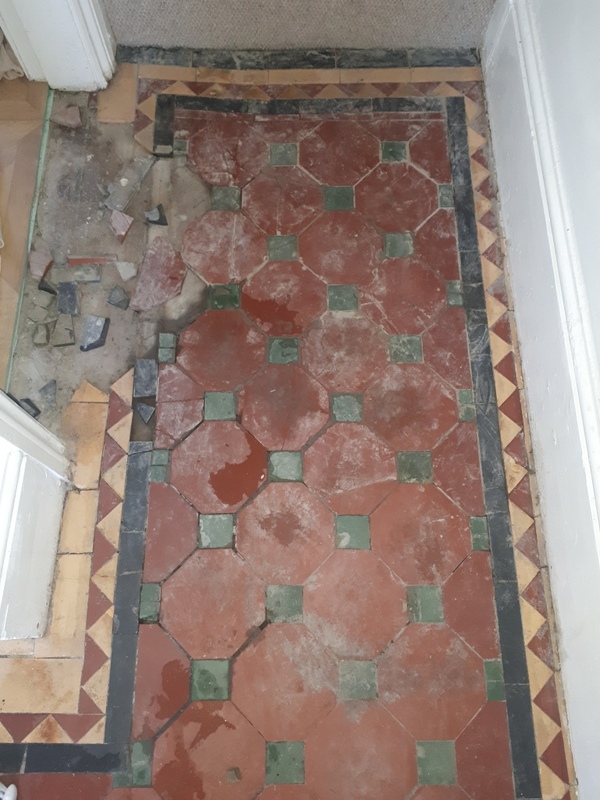 This customer got in touch with me to see if there was anything I could do to restore a Victorian tiled floor they had discovered under carpet in their hallway. 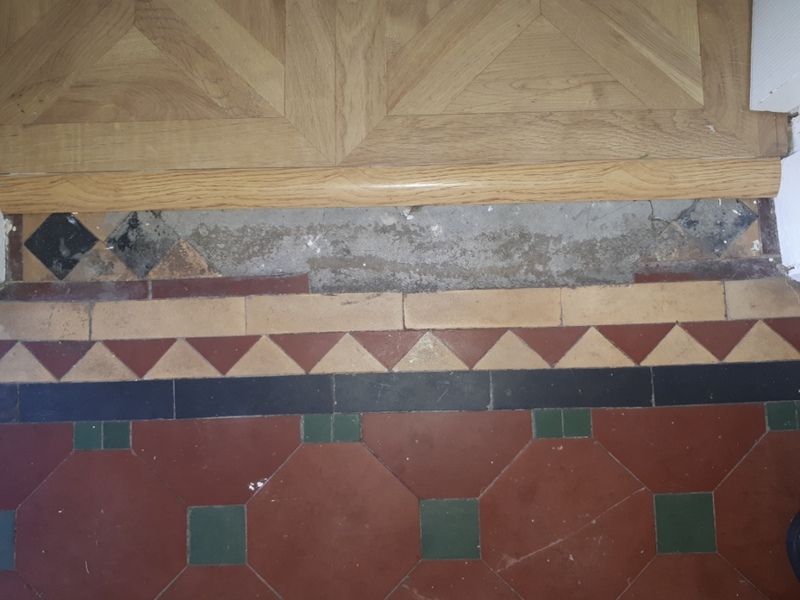 Interestingly they had been told previously that the floor was beyond repair and had been quoted thousands of pounds to have it completely ripped up and replaced. 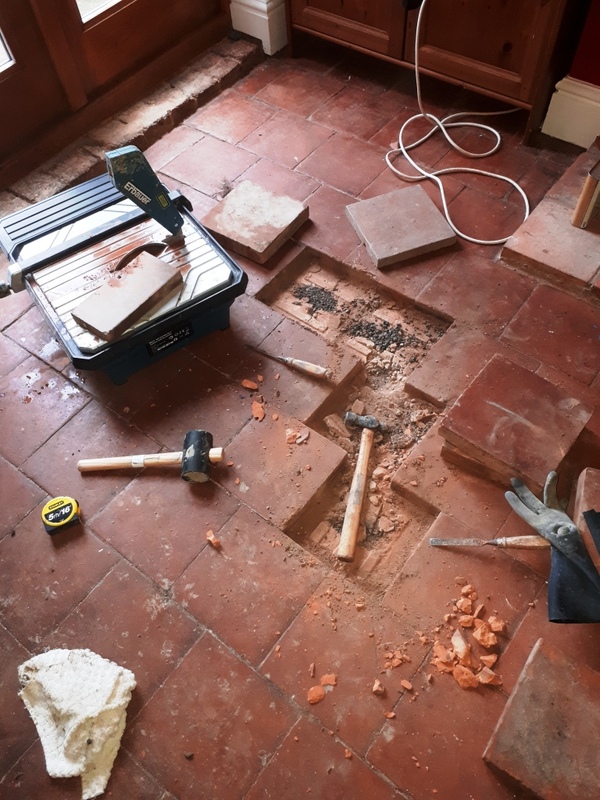 I visited the property in Bearwood near Smethwick, to take a look and could see that there was a section under a cement screed. 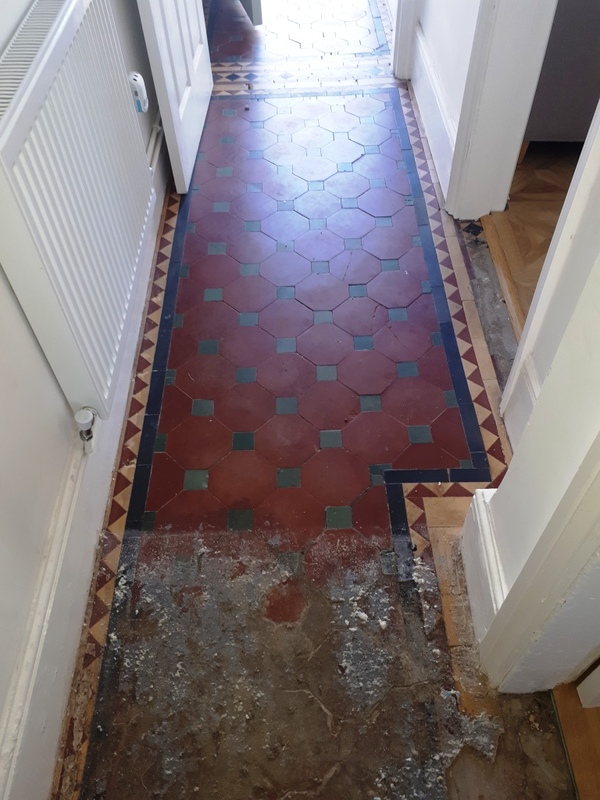 The floor was in a truly sorry state, so I could see why the other company were not keen on restoring it. 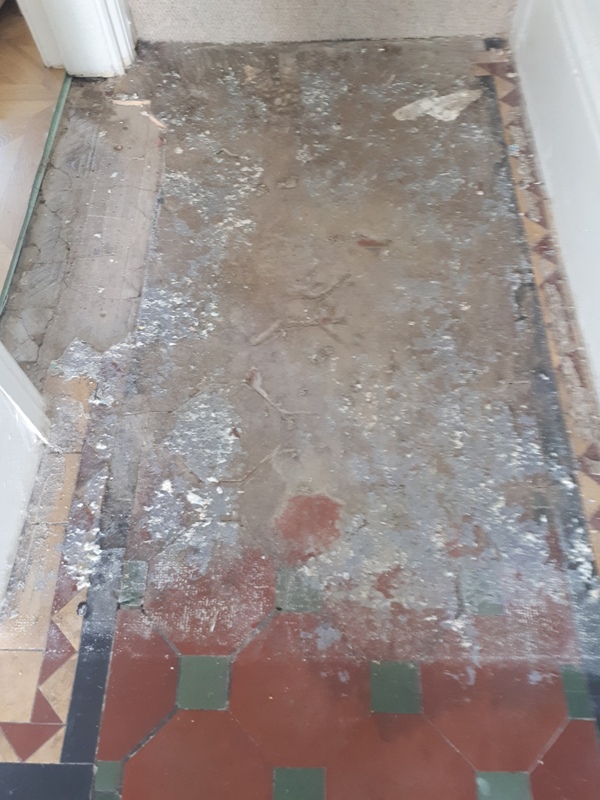 Undeterred I did a test clean to see if I could remove the screed which was encouraging however without removing all the screed it would not be possible to see what condition the tiles underneath were in. 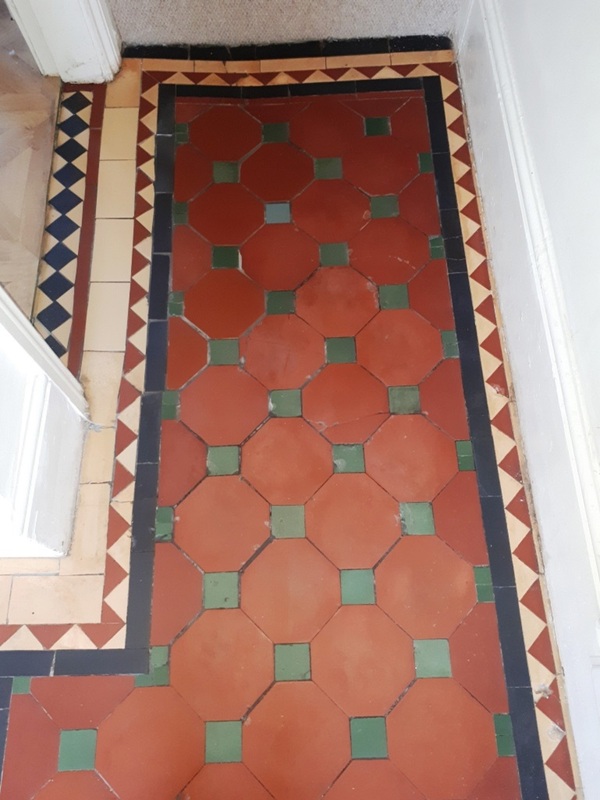 I agreed with the customer to order some replacement tiles which were needed along with extra ones just in case. The job would take a few days to allow for cleaning, repairing, drying out and sealing. The client wasn’t too optimistic, but I reassured them we could definitely get a good result. 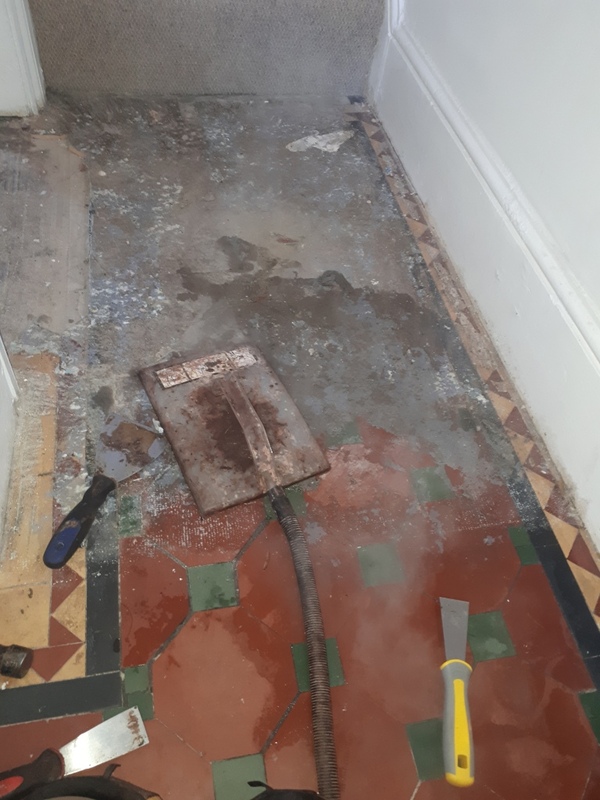 The first day was spent removing the cement screed which was quite thick in parts, so I went down the route of steaming it first to help soften the covering and then carefully scraping it off. This was quite labour intensive, but it did the job. 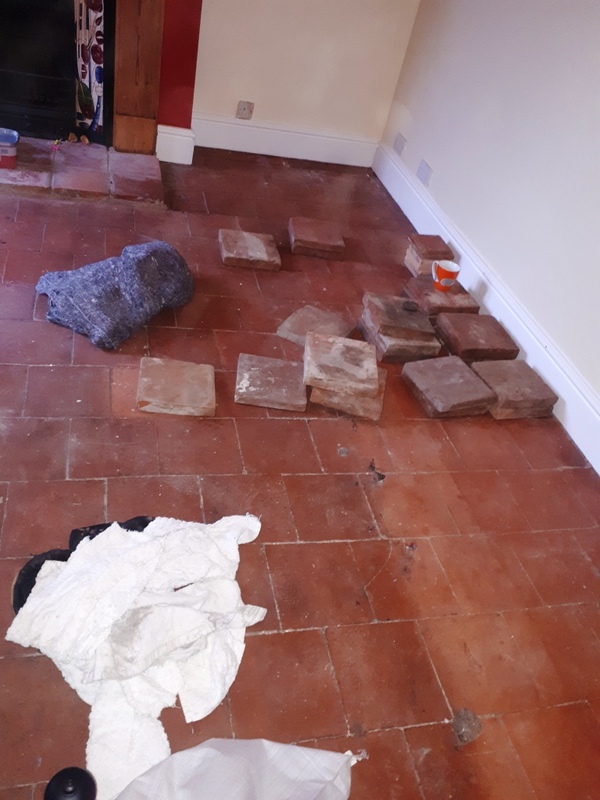 Once the cement was removed I was left with some tiles that were ok but quite a few needed to be replaced. There were also two doorways, one that needed completely relaying and one needed part relaying. 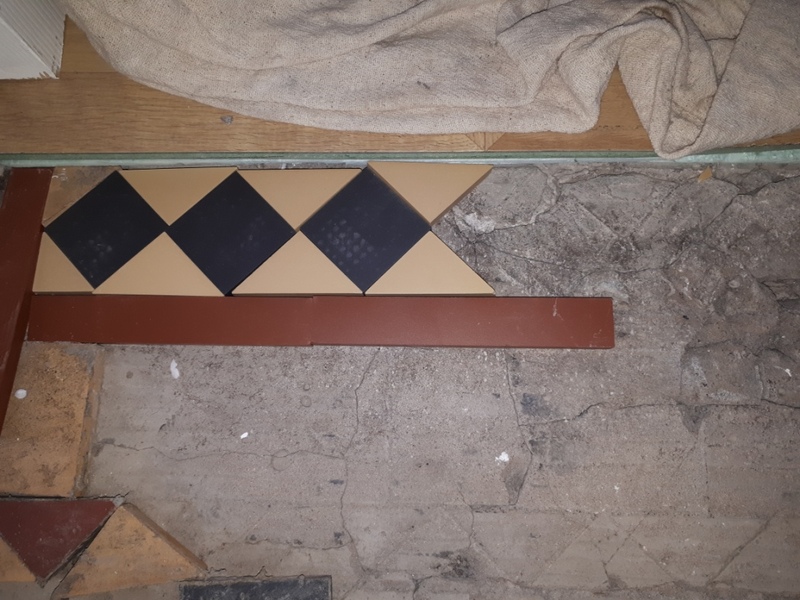 Some of the tiles needed to be cut to size, there were many tiles that needed resetting and re-grouting along with grout being applied to the new tiles. 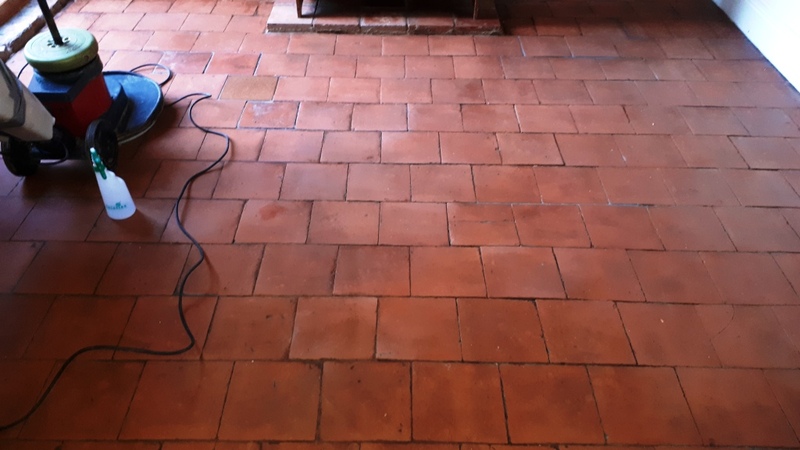 The next day the tiles were deep cleaned with a 50:50 combination of Tile Doctor Pro-Clean mixed with Nanotech HBU which stands for Heavy Build-Up Remover, which was quite appropriate in this case. This cocktail of tile cleaning products was left to dwell on the tiles for a while then worked in with a black scrubbing pad fitted to a weighted rotary machine. The floor was then rinsed off with water and then the soil extracted with a wet vacuum. 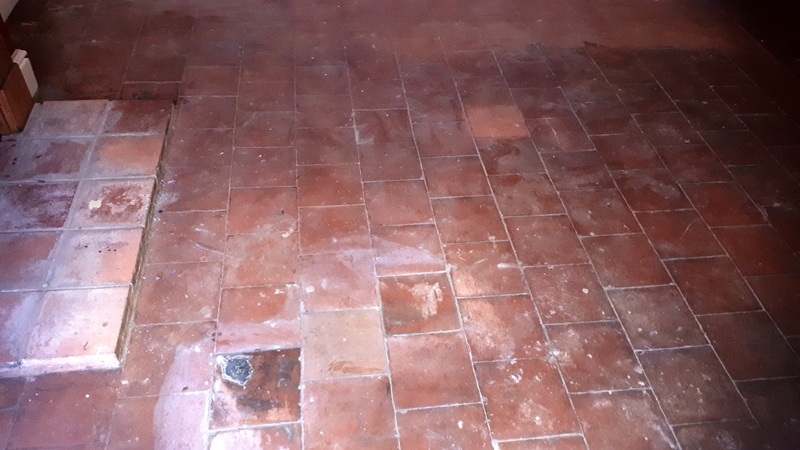 My next step was to give the floor and acid wash to remove any old grout smears and neutralise other mineral contaminates such as salts that can get deposited on the surface of the tiles as moisture evaporates as the floor dries. This is always a risk with old floors where no damp proof membrane exists. 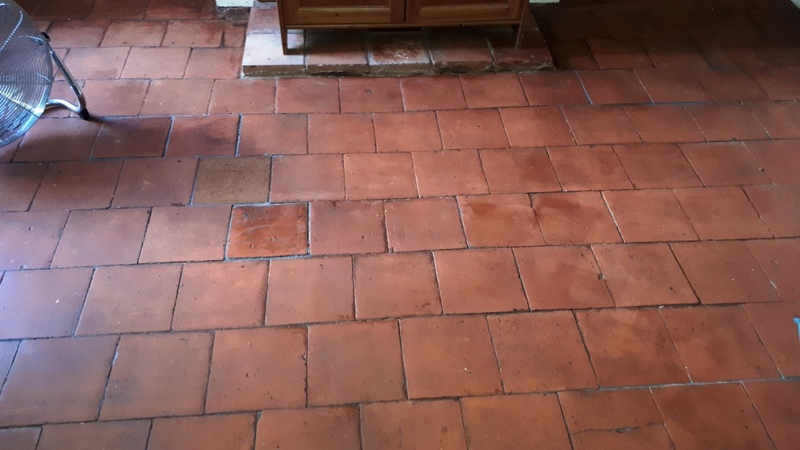 To do this I applied a dilution of Tile Doctor Grout Clean-Up which is scrubbed into the tiles with a deck brush and then rinsed off the floor with water and a wet vacuum. The floor was then left to dry out for a couple of days. 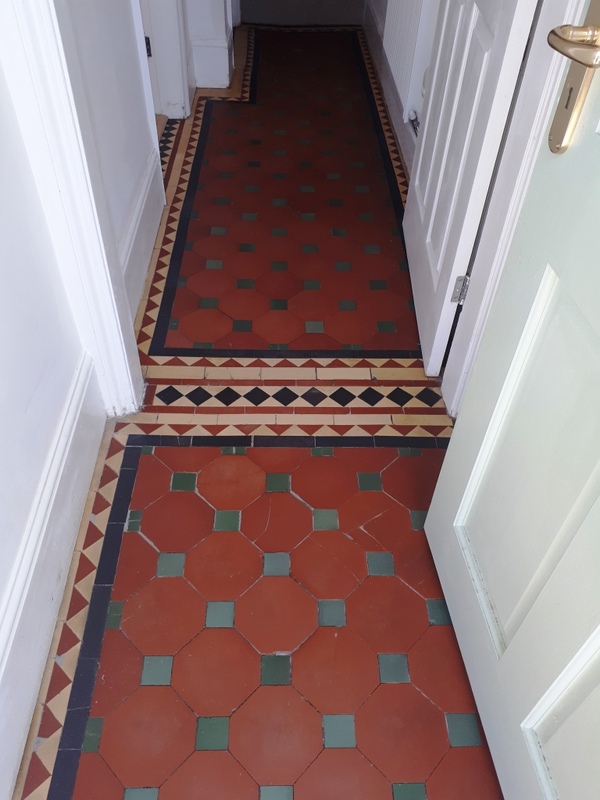 I returned to seal the floor and after check it had dried sufficiently applied three coats of Tile Doctor Colour Grow sealer. 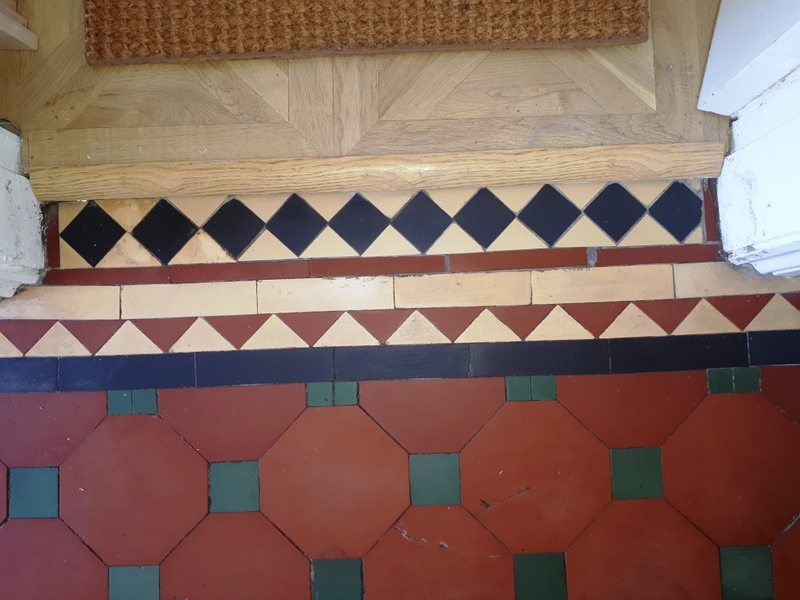 This sealer seeps into the pores of the tile enhancing the colours and leaves a matt finish which the customer had previously specified. 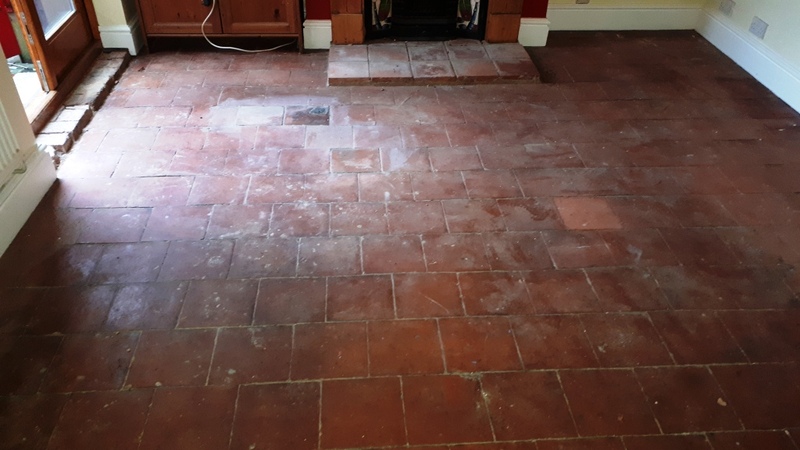 The floor was then buffed with a white pad and the customer left with a bottle of Tile Doctor Neutral Tile Cleaner to clean the floor with moving forward. The customer was delighted with the results and left the following feedback on the Tile Doctor feedback system.